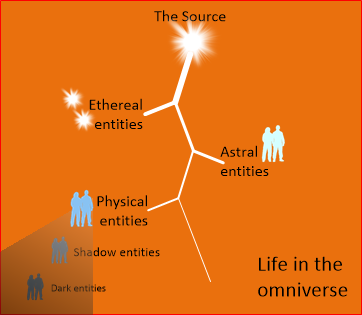 As the previous article explained, I’ve come to believe that everything in the omniverse is created and nourished by life force that streams from the central source, in the form of life, love, and omniversal knowledge. As a result, life on Earth is influenced both by vast, omnipotent, noble forces flourishing throughout the omniverse, and by weak but pervasive, savage forces stirred up in the shadows. In other words, during a lifetime on Earth we’re subject to many perplexing spiritual influences that can affect our thoughts, words, and actions, as well as our afterlife prospects. For whatever reasons, some people during a lifetime seem to be more open to noble influences of the life force, and others seem to be more susceptible to savage influences from the shadows. Other than testosterone and other hormones, I’m not exactly sure what all of those reasons are, but I suspect they’re as complex as the “karmic” factors that are involved in reincarnation, such as reparation, compensation, variation, and reputation. In any case, I’m fairly certain of one thing: All people have the opportunity during their lifetimes to foster and to strengthen their connection to the life force as it streams from the source, thereby enhancing their lives and diminishing the savage influences that boil out from the shadows. And that’s what this article is about—what we can do during a lifetime to be a clear channel for the wonderful life force that streams perpetually from the central source. Of all the articles I’ve written so far in this series, this article has the most “room for growth,” since there’s so much diverse information on the subject written by bright minds. The items below are listed in the order of how confident I am (at the moment) of their importance. The article is being posted on both websites—macyafterlife and noblesavageworld. The version on noblesavageworld will always remain in its original form, while the version on macyafterlife will probably be polished up as I learn more (from further research, inspiration, and readers’ comments). Rethink eating. I didn’t think nutrition was an important factor in spirituality until about a month ago, when reader Kate studied one particular ITC contact about “the fall of man” and she commented, “They ate Zagreus.” I laughed it off that day (it was just a myth, after all), then was awakened in the middle of the night with the same a-ha moment that Kate must have had: The ancient Zagreus allegory was probably mentioned in that ITC contact for a reason. It wasn’t just one of the random myths of yore (as I’d assumed)… but a crucial one. In the coming days after that comment by Kate, it gradually became clear to me that the main cause of “the fall of man” was (probably) the dubious decision by some of our ancient ancestors to re-engineer life on Earth so that living things on the planet could supplement their life force by eating each other and assimilating the life force of those they ate. From a spirit-world point of view, living things on Earth killing and eating each other seems barbaric and cannibalistic, with its residual fear, aggression, indignation, and humiliation that spin off to form the“hell” around our world. As we humans have been eating our fellow earth-dwellers for thousands of years, we’ve forgotten about that natural life force that streams out-beyond from our soul to nourish our physical bodies. So this becomes number 2 on the list: Be aware that the “natural” flow of life force has always been our main source of nourishment, while killing and eating other living things to assimilate their life force is just a supplemental (and a brutal and painful but biologically unavoidable) way of nourishment here on Earth. Before eating, take a moment to bless the food and to express gratitude. Consider ways to lighten up our eating habits, perhaps by minimizing the consumption of meats and lectins (self-defense toxins in many plants)… depending on your personal dietary needs. Beware of alcohol and drugs. Careless or excessive use can disrupt the connection between our conscious mind and our soul. Alcohol abuse can attract troubled spirits of dead alcoholics from the shadows who provoke the urge to drink. Late stages of alcoholism usually include delerium tremens, which, in addition to causing agonizing physical symptoms, can dredge up visions of demons and dragons and other dark, dirty secrets that our ancient ancestors tried to bury long, long ago. Hallucinogens and dissociative drugs (LSD, PCP, mescaline…) can open the mind uncontrollably to spirit realities, for better or worse. Grasp the omniverse. Especially for rational human minds that always need a reason why, it’s important to put the importance of the life force into perspective by understanding the omniverse. Years of meditation can instill in us an understanding of the omniverse, but in the meantime there are many good articles on the Internet to start learning about the afterlife and the spirit realms. Serve and support the less fortunate. Whether we’re aware of it or not, we all rely on help from bright, invisible minds in the spirit worlds to find our way in the world in the course of a lifetime. One good way to get a helping hand from finer spirit is first to lend a helping hand to others who are struggling. That seems to be a rule of thumb in the spirit worlds, at least for spirits from Earth who are trying to ascend out of darkness toward the source. They get help by helping others. Focus on the noble. Learn to distinguish between 1) noble motivations of the life force (love, good will, gratitude, honesty…) and 2) savage motivations stirred up by the predator-prey personality of terrestrial living (fear, craving, shame, deception…), and be aware of the distinction in the course of our day-to-day lives. Foster noble attitudes. This is not a complete list of ways to open ourselves up to the life force, but I think it’s a good start.